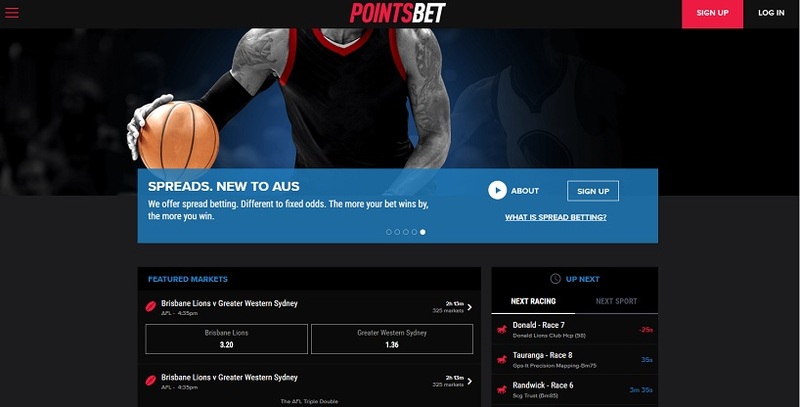 Spread betting has arrived in Australia in the form of brand new online betting agency Pointsbet. The first of its kind on our shores, Pointsbet brings the excitement of spread betting to an online format for Aussies punters, who can now ride every point, goal or stat, regardless of the result, until the very end of the contest. If you don’t already know what spread betting is, we’ll go into it in a little more detail in our Pointsbet review below! Before we run you through the Pointsbet features, it’s crucial that you understand spread betting and how it works. If you don’t have that understanding, there is potential to lose a lot of money through spread betting without even knowing it. Spread betting is tricky to wrap your head around at first, but when get the hang of it, it’s arguably one of the most fun, and (sometimes) profitable, types of betting! For every market, Pointsbet will nominate a “spread”. It’s your job to determine whether the stat or unit of measurement in the game will be higher or lower than the spread offered. If you pick correctly, you’ll win your stake multiplied by the number of points the result was over/under the spread! So a winning result can be quite profitable! The catch is that if you take the wrong side then you’ll lose your stake multiplied by the points difference. So the swings in spread betting can be pretty dramatic. But, of course, you can set a maximum exposure or loss within this. Note: information in above video correct at time of recording. Now that you’ve got the gist of it, we’ll run you through some of the features of Pointsbet and the markets they offer. Pointsbet have done really well to open with a wide range of sports on offer, currently you can bet on anything from AFL, NRL, Cricket, NFL, NBA, MLB, Soccer and a heap more. With the growth of spread betting, we expect Pointsbet to expand its markets as the concept increases in popularity as well. Pointsbet have also recently added fixed odds racing to their website, and offer some great cash back promos with major metro meets during September (more info below). When you arrive at the Pointsbet homepage, you’ll be greeted by a bunch of highlighted events and markets they have on offer. In the top right corner of the page you’ll have the option to sign up or log in. Signing up is simple and verification of your account simply requires you to send a photo of your ID and credit card to the verification email supplied. For all of you more experienced punters, Pointsbet have the option to set up a credit line, while credit card and bank transfer options are also available to deposit/withdraw. Spread betting can be risky at times and we encourage you to make sure you fully understand the way it works before creating an account with Pointsbet and having a crack at it. But if you are a seasoned punter and already have a handle on it, then we definitely recommend Pointsbet as it makes even the most boring of sports, immensely fun to watch! If spread betting is not your thing, Pointsbet also have a regular sportsbook with fixed odds betting across a wide range of markets. PointsBet are now offering all new customers a welcome deposit bonus of $200. The minimum deposit to trigger the welcome bonus is $200 to receive the $200 first deposit bonus. So long as you deposit $200, you'll get a fixed first deposit bonus of $200 (click the links on this page to receive the pre-populated DF1000 code). With this bonus code you are also eligible for all the PointsBet cash back promotions across NBA, NRL, AFL and horse racing. To celebrate the introduction of fixed odds racing at Pointsbet, they are offering punters up to $100 cash back if your horse runs second in any selected races on Wednesdays and Saturdays. If your team leads by 20 points at any stage, your head-to-head bet will be instantly paid out as a winner up to $500 staked! Available for every match of the 2018 AFL season. If your team scores 20 points, your head-to-head bet will be instantly paid out as a winner up to $200 staked! Available for every match of the 2018 NRL season.